"If I read a book and it makes my whole body so cold that no fire can ever warm me, I know that is Poetry" wrote Emily Dickinson. 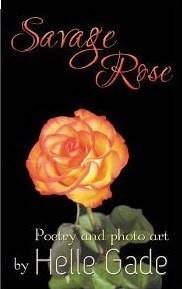 It that reflection of the world, that visual imagery were to be the sole definition of poetry, Savage Rose by Helle Gade, qualifies in flying colors. Helle is a great artisan of words and makes a great fabric of visual imagery. and the swallow is chasing bugs." The sensory liveliness is so noticeable, the imagery, one can even breath the smell of the picture she draws. Edward Hirsch wrote in his book, "The words move ahead of thought in poetry. The imagination loves reverie, the day-dreaming, the capacity of mind set in motion by words, by images." That is what poetry is, that is what Savage Rose is all about, picturesque words, grand sensual pleasure of worthy literature. Now shouting to be heard." When I walk, he trips me." and the pale, almost translucent skin"
and I will not accept it. before we break each other." It is a rare book, an immensely pleasing collection of Poems which will ring into your conscious long after you have read it. And yes, you need to read it at least twice. Brilliant work by an exceptionally talented Poet. "Mere air, these words, but delicious to hear" I quote Sappho here.